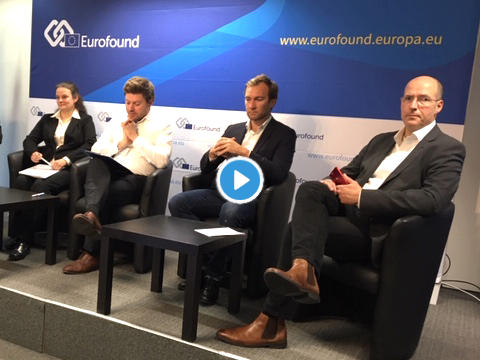 On 8 November 2018 from 14:00 to 16:00 CET, Eurofound hosted the webinar ‘Making the platform economy work well for workers’. 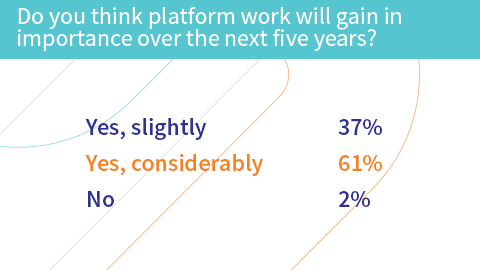 Platform work is one of the new forms of employment making a global impact. This two-hour webinar went beyond the debate about the challenges inherent in this new form of employment and focused on possible solutions to tackle the work and employment-related implications of platform work. The webinar was an opportunity to share experiences, concerns and benefits of innovative approaches aimed at addressing the issues raised by this employment form. New forms of employment and platform work should be embraced, but workers cannot be left behind. Fair working conditions and basic social rights are crucial. 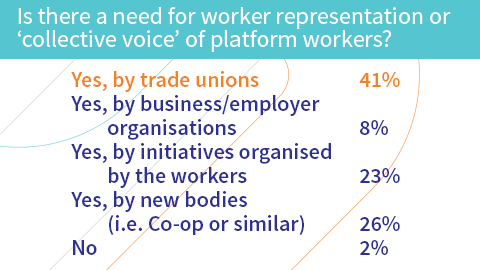 While platform work is on the increase, research carried out on 14 Member States shows that only around 8% of workers engage in it regularly and for just 2% it is their main job. The diversity of platform work is also growing. Platform work brings with it many challenges and while it is not clear how this type of work will evolve in the future, now is a good time to anticipate and focus on finding solutions to these challenges. As new forms of employment emerge, the labour market is seeing a combination of platform work and traditional employment. Although regulating platform work is important, it should not hinder the development of and opportunities for new types of work. Regulating platform work will only work if it avoids undue administrative burden. Providing an economic incentive to platform workers can also help governments to collect information about platform workers. Technology can play an important role in addressing some of the challenges related to regulating platform work by creating links between platform workers and administration and gathering real-time information about workers and the frequency of their work. A robust social protection system is essential in order to avoid creating a class of workers without protection. Providing training opportunities for platform workers is important. This type of work can be a useful stepping stone to further employment and skills development. 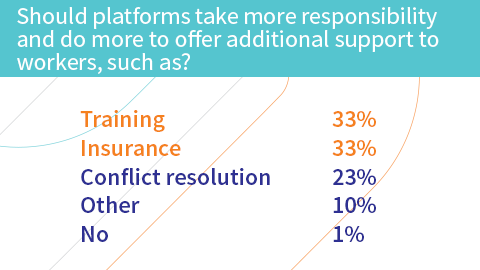 Addressing the challenges of platform work is a joint responsibility and requires the involvement of social partners, governments and platform workers. Greater exchanges of information about what is happening on the ground will help all sides to reap the benefits of platform work. Gathering data is crucial. 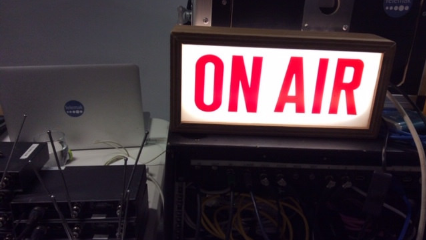 These are some key messages that emerged from the discussions on 8 November at the Eurofound webinar debate. These do not necessarily represent the views of Eurofound or its Governing Board. 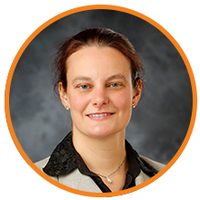 Irene Mandl is Head of the Employment Unit at Eurofound. She is mainly involved in research on labour market developments (including new forms of work and employment, digitalisation, restructuring and related public policy approaches) and topics at the intersection of employment and entrepreneurship (such as job-creation, workplace practices, small and medium-sized enterprises, business start-ups and scale-ups and internationalisation). Before joining Eurofound, she worked in policy-oriented socioeconomic research in Austria in the fields of employment and the labour market, as well as entrepreneurship and industry analysis. She holds Master’s degrees in international business administration and in business and law. Simon Kuper has been working at the Financial Times since 1994, and now writes a general column for the newspaper. 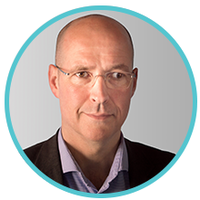 He is the author of several books including Football against the enemy (winner of the William Hill prize for Sports Book of the Year 1994), Ajax, the Dutch, the War: Football in Europe during the Second World War (2003), and (co-author with Stefan Szymanski) Soccernomics (2009). He also writes for magazines in Japan, the Netherlands, Switzerland and other countries and has won several awards for his journalism, including the Manuel Vazquez Montalban prize for sportswriting in 2008 and the British Society of Magazine Editors’ prize for columnist of the year in 2016. He was educated at Oxford University and Harvard. Andreas Valkiers is the adviser to the Belgian Minister of Health and Social Affairs, supporting the minister on public policy responses to new forms of work, such as platform work. He holds a Master's in law with a specialisation in public and social law from KU Leuven, as well as a Master's in law and economics (University of Bologna and Indira Gandhi Institute of Development Research). He is also an attorney focusing on labour and social security law. Thorkild Holmboe-Hay has been policy and communications adviser at the major Danish trade union 3F since 2015. He is an experienced political consultant, with long experience in management in the not-for-profit sector. With a background in media and communication, he has specialised in political communication, employment law, political strategy, strategic consulting and leadership development. He holds a Master's in employment relations and human resource management from the University of Aalborg and also studied political leadership and political communications at the universities of Aarhus and South Denmark. 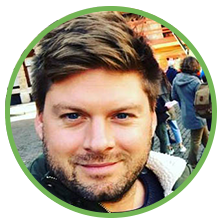 He is currently undertaking a postgraduate course in professional communications at Roskilde University. 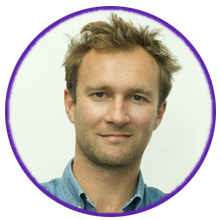 Augustin Verlinde is CEO and co-founder of Frizbiz. Frizbiz is an online French marketplace that matches available workers with local demand, allowing consumers to find providers for home services such as painting, installing furniture and moving home. Previously, he was UK country manager for a consulting firm specialising in quantitative techniques and risk management for financial ventures. 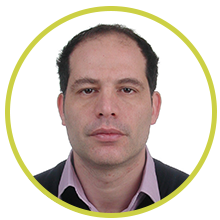 He holds a Master's in strategy from EMLYON and CentraleSupélec and an MSc from IPAG Business School Paris. He currently sits on the advisory board of Orange Business Services. Platform work is the online matching of the supply of and demand for paid work. It remains small in scale in Europe but is evolving rapidly. Initially, this employment form was largely limited to low-paid, low-skilled, online micro-tasks. As it grows, however, an increasingly wide and varied range of tasks is being mediated by online platforms. To map the complexity of these recent developments, Eurofound has established a classification, of platform work. In its research, it found ten types where a critical mass of platforms and affiliated workers has been reached in the EU. An in-depth analysis of three of these types shows that some of the benefits and challenges that workers are experiencing are shared. Others, however, are specific to the individual type of platform work. This means that any discussion on potential positive and/or negative effects of platform work, and the resulting policy responses, requires a more differentiated focus rather than a one-size-fits-all approach. Participants are invited to consult Eurofound's webinar disclaimer and note on the processing of personal data in the context of the webinar (pdf).